Nowadays so many complaints are coming for Aadhar Card. Cards are not reaching in proper hands or not delivered yet. Many more peoples still don't know what to do in such case. They just google here and there. If they find any unofficial website related to UIDAI or Aadhar information they just post their queries without knowing that they are posting unnecessarily their personal information there. That's not good to post all your social security information. Here, I would like to give advice to those peoples who are the victim of such cases that where ever you are posting your personal information at that time make sure that place is right place means valid service related portal or government-related portal. Don't disclose all your personal data. For Aadhar problem you can contact only to this number, can send the email or postal mail to the address given below. In case you lost your enrollment slip. Please go to this link. Fill out al the required information. the At second step you will receive one-time password (OTP). Enter the same. You will receive a pdf file in the download. This type of file can be opened in the application like adobe reader. The file is password protected. To open it. Just enter the first three character of your name and last four digits of the birth date. For example, my name is Jitendra born in 1991. I will enter jit1991 to open the ile. 1. Aadhar letter not received. 3. Aadhar rejected or invalid reason. 6. Delivery of Aadhar to incorrect recipient. If the doubt rises to feel free to ask here. my sister has not received aadhar card since 2014, we were not given any adhar enrollment no. how can I get her Adhar card ???? .From past 45days aadhar status showing that ur aadhar may be delay. but am checking bio-metric unlocking status it showing that ur aadhar is suspended due to integrity issues please submitted valid proof . but it showing no record.how many time should i enroll for authentication. if i call to help in center no one is responding to my request..is it a rightway that uidai govt to play with a common person.please rectify my problem as soon as possible ..i can’t effort money my education purpose.please understand my problem and respond to my complaint.they given me 5 days time..
We have not received aadhar cards more than one year old. Our aadhar card sl. no. are 1190/10942/00836 29/03/2011 22:58:42 and 1190/10942/00838 29/03/2011 23:15:51. Is it possible to get after one year pass at least. i have had applied for aadhar card almost two years back ..but still i have not received my card yet ..after checking your above link, i am getting msg saying that (Sorry! we could not find Item Number in our System for this EID Number) even i tried to check my aadhar status online but i am unable to see it ..pls help me what to do ? above help line no. is also not working ..
• If the resident remembers the enrolment no. or has a copy of the enrolment receipt, Aadhaar no. can be retrieved based on that. Letter will be resent on recorded address and e-mail. If the Resident has given a mobile no. while enrolment, the Aadhaar no. will be sent via SMS also. • If the resident remembers the name of the registrar through whom he/she enrolled and the date & place of enrolment, the Aadhaar no. could be looked up based on other demographic details such as name, DoB/age, relative’s name, address, phone no. If the data can be retrieved using these means, letter, e-mail and SMS informing resident of the Aadhaar no. will be dispatched to resident on the address /e-mail / phone no available in the CIDR. This facility will be available in a later release, perhaps ver 3.0. • If the record cannot be retrieved by the means mentioned above, the resident should be asked to go to an update / enrolment centre & request for a lost Aadhaar no. retrieval. This facility will be available in software release 2.0.
i have lost my Aadhar card . how can i get it again . Hi Jitendra,do you have any idea about alternate Toll Free numbers as current number not in service. Do the two things..first of visit your area head post office and inquire there second you can go through the link of post adhar complain in the above post..
Do contact on above address. if adhar card status showing delivered than please contact your local post office. no problem..kindly contact to your adhar enrollment center where you have enrolled before. f the resident remembers the name of the registrar through whom he/she enrolled and the date & place of enrolment, the Aadhaar no. could be looked up based on other demographic details such as name, DoB/age, relative’s name, address, phone no. we have not yet received aadhaar cards it was more than 11 months. My Enrolment no. is 1028/11008/17364 date 18/10/2011 time 10.30.39. Please help us. dear mamta first of all check adhar card status by visiting official website. if it shows delivered than kindly inquire at your local post office. still not getting than along with your documents re-visit the registration booth of adhar card and consult with the officers. we are not receive Adhar card it was more than twenty manth. Please, go through video under enigmaozne channel on youtube..the only web page look have been changed, rest of is same. 1027/00692/41262 , date - 25/03/2012 , $ time - 15:33:44. Please send my aadhaar card immediately. I have checked aadhaar card current status also it is not displaying anything. please post your complain through official web site of aadhar..the link you can find in the above post. Is print out of e-aadhar card valid everywhere ?? if the print out is taken from their official web site and having uid and barcode ...absolutely it is valid..
1171/02010/00497 , date - 10/05/2011 , time - 15:53:26. Please send my aadhaar card immediately. 1218/19185/00636 , date - 01/09/2011 , time - 10:51:26. Please send my aadhaar card immediately. my mobile no old 9701489357 this my missing number. Post your complain on the official website..the link you can find in the above post. find out there. I have not received yet my aadharcard.more then 1 n Half year..pls help me what i do to get the aadhar card.. I HAVE NOT RECEIVED YET MY AADHARCARD MORE THAN ONE YEAR...PLS HELP ME WHAT I DOTO GET MY AADHARCARD.MY FAMILYS ENROLMENT NO 1)1216/01043/00287 2)1216/01043/00286. 3)1216/01043/00285 DATED 24/12/2011 MY POSTAL ADRESS-606/A SANGAM CO .OP. HOUSING SOCITY LTD MANIPADA SANTACRUZ (E) MUMBAI-400098. "We are continuously enhancing Aadhaar letter printing capacity so that you can receive the letter at the earliest. Kindly bear with us for some more time.We are working towards delivering your Aadhaar number to you at the earliest"
Your Contact Number - 1-800-180-1947 is not working this an another Jock by Aadhar. Whom should I complain. Should I represent through News paper ? Is there some one who can help in this matter. Can I apply again ? May I have definite date say within one month or within three month I will receive the card. dear Dinesh please go through the offical website complain link.. which you can find here on above post..read it carefully. My Mothers name is Anita Rani. I have not receive my aadhaar card of her. The enrollment number is 1218/22050/11360 and time is 15/10/2011 09:43:03. If i check the status it says that it has been generated and delivered. In my local post office i have asked they said they have not received it yet. So where has the card gone??? If i try to download it online. I don't receive any otp on my mobile number, once i received but after 6 hours. Since i have tried many times but no otp is received. So wat to do now??? Dear Sonal..kindly place your complain to their official website by visiting link in above post..read it carefully. and one more what is meant by resident name??? where else we can get a PDF adhar card directly. Resident name means applicant itself.. I lost my aadhar card but i have the letter bearing the aadhar no. , enrollment no. and date .pls tell me how can i get the aadhar card ? i tried to contact on helpline no. but its coming busy. I & my wife applied for adhar card vide enrolment no 1212/00110/00427 &1212/00110/00428 on 24/10/2011.....1212/00110/ 00428 has not been recd sofar.On the status it shows that 1212/00110/00427could not find item Number in our system of this EID Number where as I have recd &1212/00110/00428 delivered on 11-05-2012, but not recd sofar. i have not recived my adhar card from the enrolls of 1 year. I have enrolled with my family nearly 1 and half year back. I have not received by cards yet. When i tried to check online, it is giving the following message. Your enrolment status not availabe with us for detail status please visit (http://portal.uidai.gov.in). What does this mean, do i need to re-enroll? Whom should i contact. we have not yet received aadhar cards it was more than 12 months. 2006/10766/01733 date 27/09/2011 time 17:44:20.please help us. what does means of resident name in aadhar? 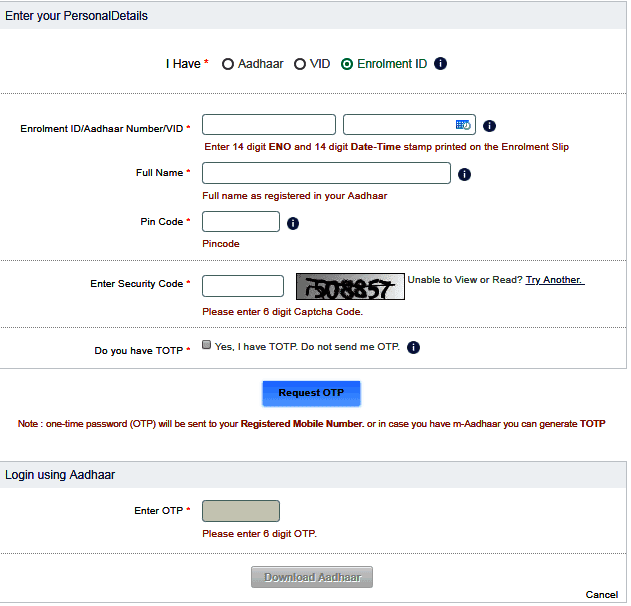 I am not getting the OTP no on my mobile phone in order to download my aadhar card online. i had not recived my aadhar card . Over 1.5 years and the cards are not received. Status shows generated. Post office records show not in file. Complaint telephone numbers, nobody picks up the telephone. Have written e-mails complaints, no response. Try to print online Adhaar cards, it shows server error. The entire Adhaar team should be whipped and shot for taking the entire nation into a wild ride. Sir, I, Obulasetty Rama Prasad of Bhimavaram Town, West Godavary District, Andhra Pradesh. We are not received our Family AADHAAR Cards till today. Enrolement ID: 1027002530437120110624110030 on 24-06-2011 at 11:12:51 a.m.
enrolment Nos. 1) Obulasetty Rama Prasad - 1027/00253/04371 on 24-06-2011 at 11:00:30 a.m.
2) Obulasetty Hemantha Kumari - 1027/00253/04372 on 24-06-2011 at 11:04:40 a.m.
3) Obulasetty Naga Venkata Kusuma Kishore - 1027/00253/04373 on 24-06-2011 at 11:09:47a.m. Please arrange and send our family AADHAAR Cards at an early. Thanking you Sir, awaiting your valuable reply. Bhimavaram – 534 201. West Godavary District, Andhra Pradesh. I have enrolled with my family nearly 1 and half year back. I have not received my cards yet. When i tried to check online, it is giving the following message. Your enrolment status not available with us for detail status please visit (http://portal.uidai.gov.in). Please arrange and send our family AADHAAR Cards. Let a Law be made so that any data collected for this purpose can be used only by the government for only the purpose for it needs to be utilized and no other purpose and let any person or entity transferring this data to any other person or entity be strictly punished for it, otherwise let this scheme be discarded forever. One of my family memeber's AADHAR Card not yet generated more than three months time has passed. If i file complaint in UIDAI What are the possibilities to get the result. No body will help. They are just raw stones. 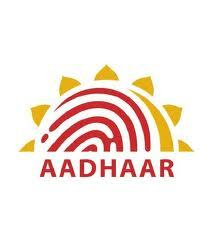 I am fighting to get Aadhar for last 3 years. What is 3 Months ? file an RTI with Planning commission. You will get your AADHAR card before u get RTI reply i.e. within 30 days. I got mine. Just try it. I had applied for a AADHAR card on 17/04/2012, it is still not generated. I had already given lots of emails and complained also on the UIDAI website but of no help.what to do? sir my wife lost her ernollment recipt . Nobody looks after your complaint. I am fighting for last 3 years to get the Aadhar card. 1218/16852/03816 08/08/2011 11:38:31 was cancelled and I was asked to enroll again for Aadhar. The new enrollment 2048/41501/00128 28/08/2014 18:45:20 seems to be rejected. I am trying to get Aadhar card since last 3 years but am not getting it. My name is Umesh Kumar Keshri. I have not received my aadhar card, last year I applied for aadhaar card on dated 07-09-2013 but not received till date. Please send as soon as possible my aadhaar card. Me n my mom applied to aadhaar card at same time but yet my mom not got it. She dnt know her enrollment no. I want to check my mom's aadhaar status how can I?? First of all you need to update your mobile number. For that , visit your local city civic center to update mobile number. After updating mobile number you can download e-aadhar according to the process shown here in this post. Sir, This is not an official portal of aadhaar. We just provide help on it. I request you to go through the steps given in above post.